Up to the point that I actually did a track day, I really, really wanted to do a track day. I’d played enough Forza to want to do it in real life. And in my eagerness, I completely overlooked the fundamental steps that one should take to prepare for an actual track day. Here is precisely how I fucked up my first one, and how you can avoid doing the same. Like any other big and potentially dangerous activity, preparing for a track day requires research. On Jalopnik, we have countless posts that outline what you should and shouldn’t do. Some people go more in depth with their prep work than others, but it’s generally understood that you should give your car a good once-over before putting it through a track day. This ensures safety not only to you but to everyone else participating at the track day. I ignored all that stuff. This was years ago, well before I started working in automotive journalism. In those days, I was young and dumb and relied on the fact that my car had been in the family since it was new and went in for service regularly. From that, I figured that everything was kosher. Never mind that tracking a car is putting it under the most stress that it will ever experience and everything (fluids, tire wear, brakes suspension, etc.) needs to be in tip-top shape. It was from this baseless assumption and ignorance that I set out to Big Willow one December morning, nearly 90 miles east of LA, seeing nothing amiss. The day was through a company called Keep Racing Off Public Streets, which is an organization that works to raise awareness of the dangers of street racing. They believe in holding track days for people so that they learn to drive their cars correctly and they can blow off some steam in a controlled environment. It’s pretty great. Problem was, I was in the early stages of a sinus infection that day. The kind that messes up your balance and makes you feel like your head is filled with water. But I wasn’t about to pass up my first track day. I had just gotten my C32 AMG shipped over from the East Coast about three months prior and I was eager to see what it could do. In fact, I didn’t check my brakes or brake pads, my tire tread depth, the suspension, lug nuts or the oil level. I had no idea how old the tires were, only that they were Michelin Pilot Sport PS2s. I did check tire, pressure, though! At least there was that. I also didn’t have a proper racing helmet, so I wore a borrowed motorcycle helmet. No driving shoes, just a beat-up pair of Chucks. Nor did I even think of buying racing insurance for the day, which you should always do before a track day. An ounce of prevention is worth a pound of cure and all that. I paid very careful attention during the classroom session. They gave all the cars a technical inspection before anyone was allowed to start, which I was grateful for. I stupidly figured that if there was something seriously wrong with the car, they’d find it and tell me. Then they sent me out to do a few practice laps with an instructor in the front seat, yelling instructions to me over the roar of the wind. Happily, the tires warmed up nicely and felt very happy to be engaging in such sport. The C32 is a fun and nimble little car with enough torque and horsepower to run into triple-digit speeds along Big Willow’s main straight. With each lap, I felt like I got to know it better and better and that I was more comfortable pushing it further and further. When I pulled into the paddock after my session, I put my car in park and set the parking brake. Again, thinking nothing of it. It wasn’t until someone pointed out my mistake to me that I disengaged it. Coming off a track with your brakes hot like that and then engaging the parking brake can sometimes cause some distorting and things might weld together. That’s bad. Throughout the day, I could feel my sinus infection tilt my sense of balance from within my head. It was not helping anything. To give myself a break, I let someone who wasn’t me take my car out for a couple of laps. It was the person I came to the track day with, but still! I shudder thinking about it now—what if something bad had happened? After lunch, I was feeling pretty good about myself, despite still not being able to hear out of one ear. I was definitely not the slowest person there that day, which was a relief. I had pulled off some passes. I was learning the braking points and hitting the apexes nicely. When it came time for my session again, I pulled back onto the track, ready to beat my other lap times. I forgot that you’re supposed to take the first lap more slowly to let your tires warm up. The first few corners went by without issue. Then, around Turn 6, the rear of my car stepped out and I wasn’t quick enough to catch it. I spun off the track at 85 mph and down a hill. Dirt and rocks exploded into the cabin from the lowered windows, which were a requirement. For a wild and fleeting second, I thought that I had done it and that I was going to flip my car and it would all be over. We whirled twice and finally came to a breathless, complete stop. I couldn’t hear anything other than the pounding of my own heart in my ears. I let go of the steering wheel. My hands were shaking. Slowly, I shut off the car and waited for one of the track marshals to come get me. The truck came, the red flags were waving. I turned my car back on and eased it back on the track, driving it slowly back to the paddock. The front left tire was limping, I could feel it. We hobbled back into the paddock, where the marshal asked if I was alright. I said yes. “Did you take your hands off the wheel when you spun, like we talked about?” he asked. No, I had forgotten about that, too. I had torn the sidewall of my tire. Thankfully, though, some friendly guys at the track took pity on me. They used the mechanical jack that they had brought and changed out the damaged wheel with a spare one that I had in my trunk. They told me to cheer up, that I hadn’t done any serious damage to my car and that everyone crashes. It helped a little, but my confidence for the day was shot. The left side of my car now featured a spattering of rock chips and peppering because I had neglected to tape anything up. Battle scars, I thought to myself sardonically. As the sun started to set, I got back on the highway to drive the 90 miles back home. I did not check my fluids or tire wear or brakes when I got back. In fact, I checked nothing until it was time for the scheduled service again—six months later. Wrong: you should always check for leaks and such because the vibration from track driving at high RPMs can loosen up bolts. I’ve spent a lot more time around cars and the smart people that often come with cars, so these days, I’d like to think I know a lot better. 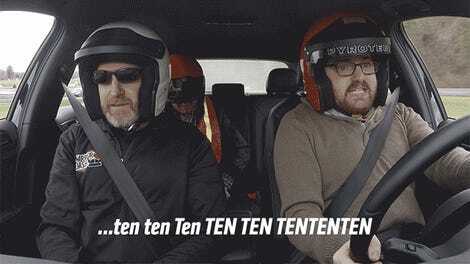 I’ve been exposed to the right and proper way to approach a track day. Today, I write this, humbled before you, because I recognize the egregious error of my ways. I don’t want anyone here to make the mistakes I did because it could be very dangerous. I was lucky nothing serious happened. So, for the love of all that is holy, before your first track day, please, please do your research. Don’t be like me. And don’t let hubris get the better of you.